If you want to loosen a screw but you are worried about stripping or shearing the screw, a regular cordless impact driver is not the correct tool to use; it provides too much rotational torque. The correct tool to use is a Hand Impact. Instead of rotational torque, the Hand Impact in conjunction with a hammer, provides mostly downward torque with very little rotation. Basically, a Hand Impact is a fancy screwdriver that can take a beating, and provides a small amount of rotation with each strike. You can find Hand Impacts ranging from a few dollars on up, from places like Harbor Freight, Amazon, or Lee Valley. 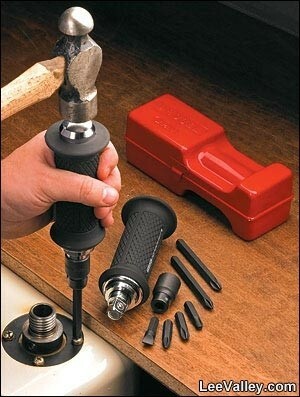 So the next time you have a seized screw or bolt, be sure to use the correct tools for the job.